World Health Day was celebrated on 7 April with a focus on universal health coverage. 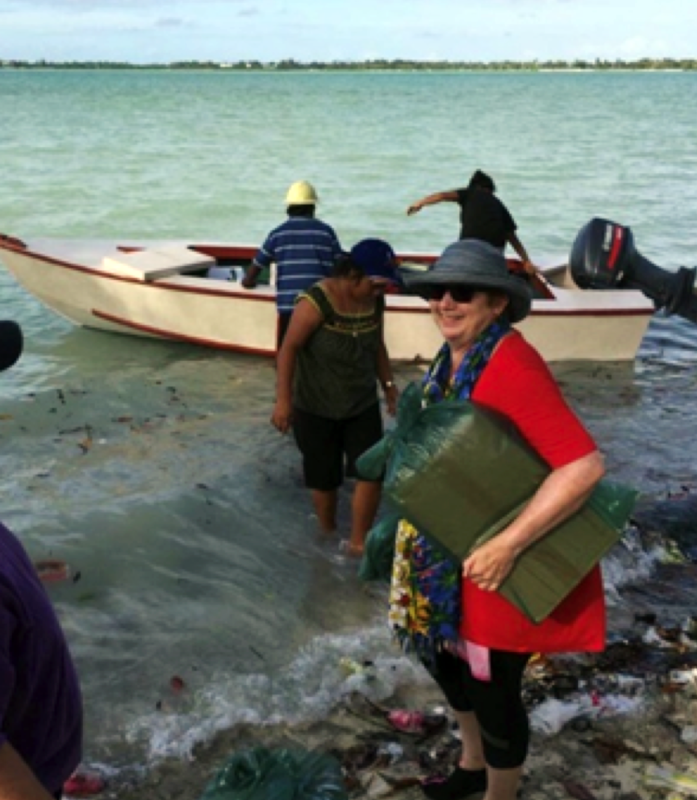 Marie Mohr reflects on the current health situation in Kiribati on a recent trip to visit the Good Samaritan Sisters’ ministry in the country. As the Sisters of the Good Samaritan’s Health and Wellbeing Coordinator Marie Mohr visited Kiribati with Sister Meg Kahler SGS in February this year, to meet with the seven Kiribati Good Samaritan Sisters living there, and to gain an insight to the level of health services available across the country. 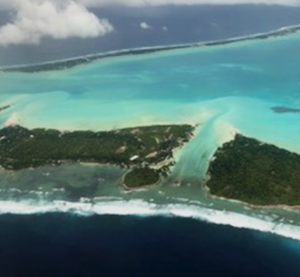 The view of Kiribati from the air. Kiribati is an island nation located on the Equator in the Pacific Ocean and has three island groups – Gilbert, Phoenix and Line – comprising 32 atolls and one raised coral island. Before her recent visit, Marie had little knowledge of the country. 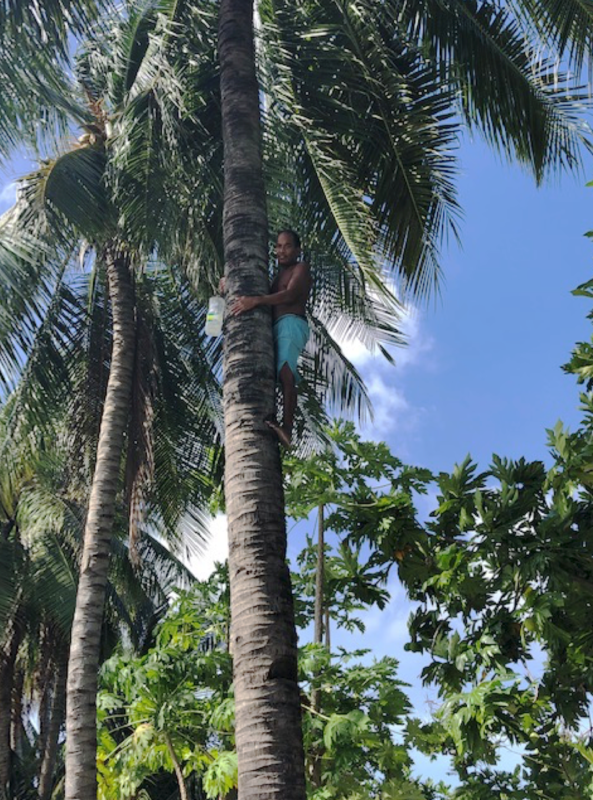 The current population is estimated at around 120,428 with over 90 per cent living in the Gilbert Islands, and over 33 per cent of the population living in an area of just 9.9 square kilometres on South Tarawa. This concentrated living is a shift from the traditional way of life in villages spread across various islands. Climate change is a key challenge for the Kiribati people with the high population density and rising sea levels causing the relocation of many villages. “Spending time with the Sisters provided a great insight into the reality of life in Kiribati and the impact of climate change,” Marie reflects. “Driving around the island you could see the effects of rising sea levels, the loss of vegetation from the salt water incursion, and the problem of increasing waste and rubbish collection in the local land fill locations. 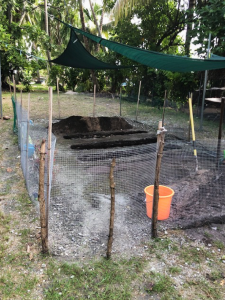 The vegetable garden in progress. “We also heard stories of the local people who had to relocate their families and villages as the sea levels rose,” she says. “The villagers had to deal with the aftermath of the king tide where the waves broke through the sea walls, flooding which inundated their houses, and their milk fish ponds being washed away. “It is a sobering reminder of the susceptibility and vulnerability of this country,” Marie says. Limited access to a variety of fresh fruit and vegetables is also a reality of life on Kiribati. 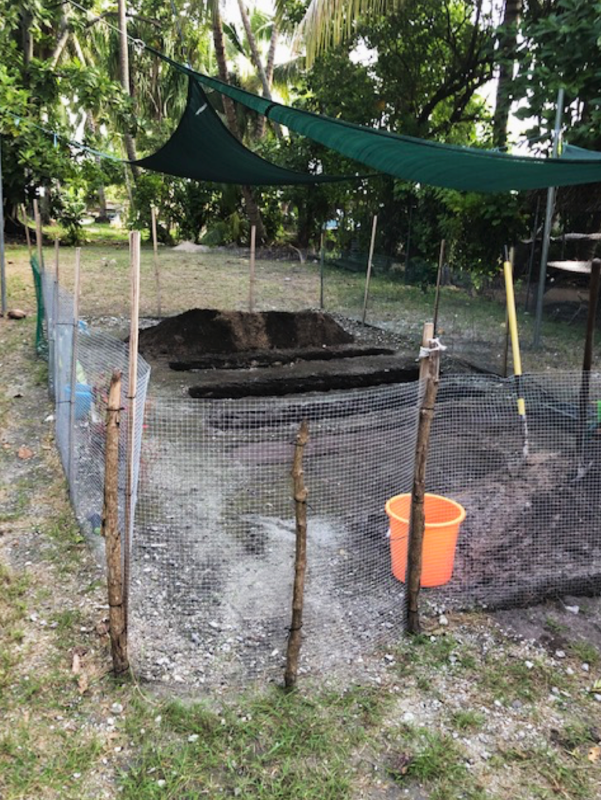 The Sisters at Temaiku are currently working on preparing a vegetable garden plot for their use, which Marie says will require serious planning as the soil needs significant nurturing. Many of the Kiribati people drink fresh toddy each day. The visit included two Good Samaritan communities in Kiribati – one in Temaiku and the other in Abaokoro. Travel between the islands is limited, and by boat. South Tarawa has roadways and a causeway, however a number of the islands have limited vehicle access, despite an increase in the number of vehicles on the island in recent years. “It was a privilege to accompany the Sisters from Temiaku,” says Marie, “to their places of ministry – a school for disabled children with Sister Kawi Arebonto SGS, and to the prison with Sister Juniko Toaua SGS. On Abaokoro, the three Sisters run the Good Samaritan preschool and meeting the preschool children is an experience Marie says she will “treasure”. 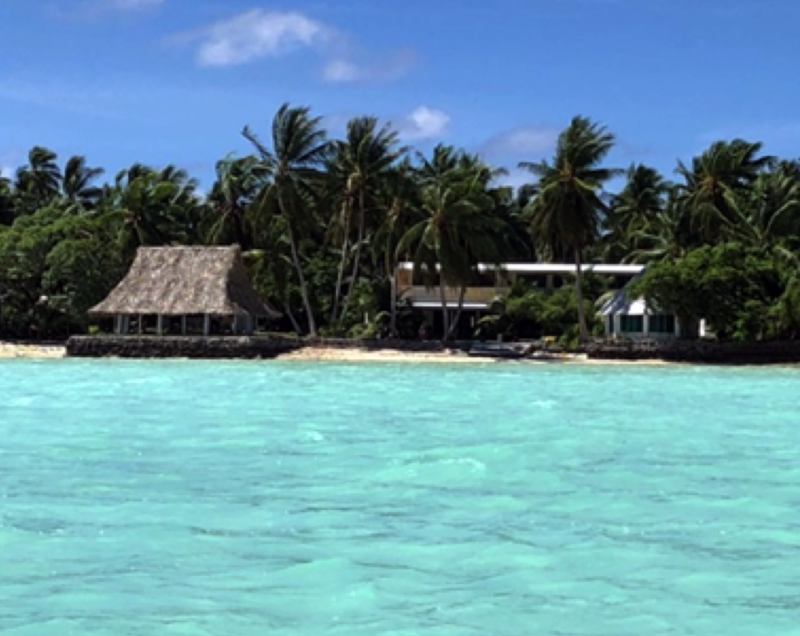 There is a well-established publicly-funded health system in Kiribati and the Tungaru Central Hospital in Tarawa provides medical services to all the islands through the primary health care network, consisting of health centres and health clinics. Sr Tenta and the children at the preschool. Marie says the system is adequate for basic medical care, however there are no specialised clinical services offered in Kiribati. The only specialist services are offered by visiting teams or through off-shore referral arrangements. There is also a parallel traditional health system that exists. During their visit, Marie and Meg had the opportunity to meet with a number of health care services and government representatives including Dr Ioanna Beratau, the Assistant Director of the Tungaru Central Hospital in Nawerewere; Kakiateiti Erikate, the Project Coordinator for the Nutrition program through the Australian High Commission Department of Foreign Affairs and Trading (DFAT); Monica Tauman from the Medical Assistant Health Clinic South Tarawa; Taterei Maritino, a Registered Nurse with the Ministry of Health; Tekarika, a Medical Assistant at Abaokoro Health Clinic; and the Kiribati Family Health Association (KFHA). Their discussions highlighted the ongoing significant burden of disease that exists within communities throughout Kiribati. 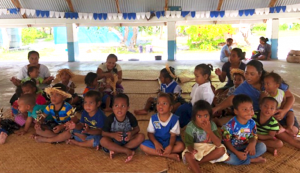 The Expanded Program on Immunisation (EPI) was introduced in Kiribati in the early 1980s to protect children against diphtheria, measles, pertussis, poliomyelitis, tetanus and tuberculosis, and its women against maternal tetanus. In more recent years they have introduced the Rotavirus and Pneumococcal vaccinations into this program. 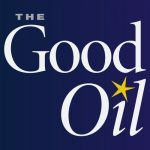 “Nutrition is a significant health risk factor,” Marie says. “With the increased consumption of imported foods which are high in salt, sugar and fat, this has contributed to the increasing incidences of non-communicable diseases such as obesity, diabetes, high blood pressure and cardiac disease. “Stroke has also become a significant health problem over the past two decades, and in recent years the incidence of breast and cervical cancer has been identified as an area of focus for the Government,” she says. “The local health clinics have the capacity to monitor and treat high blood pressure and diabetes, as well as participate in the number of public health programs including women’s health screening programs,” Marie says. The local health clinics are able to refer cases through to the relevant outpatient clinics at the Tungaru Central Hospital or specialist through visiting teams such as the Royal Australian College of Surgeons (RACS), Taiwan Medical cardiology Teams, the Osakawa Eye Team from Japan, and volunteering obstetrics and gynaecology specialists from New Zealand. These services are delivered through the Tungaru Central Hospital. Major surgical intervention is not available in Kiribati and is facilitated through off shore referral to one of these countries. 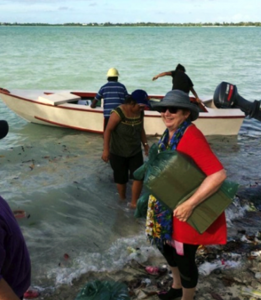 Marie says it was reassuring to find the health system in Kiribati was better resourced than she expected, however the growing environmental issues are of great concern from overcrowding, and the lack of safe water and sanitation continue to impact on the health of the Kiribati people.